AMS Executive Director Emeritus Kenneth C. Spengler, a vital force in the growth of the AMS after World War II, passed away yesterday at the age of 94. 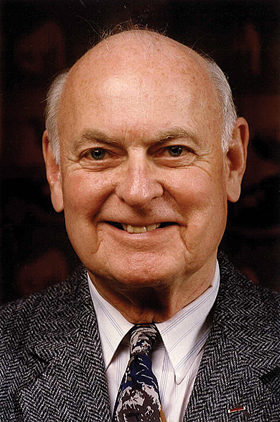 Dr. Spengler was executive director of the AMS from 1946 to 1988, leading the Society at a time when membership surged from 2,000 to about 10,000. In 1958, he negotiated the acquisition of the current AMS Headquarters building at 45 Beacon Street in Boston. The entire AMS community extends its condolences to Dr. Spengler’s family. We invite our readers to share their favorite stories and memories of Dr. Spengler in the comments. UPDATE: The wake for Dr. Spengler will be held on Sunday, January 31, from 3:00 to 7:00 p.m. at the Douglass Funeral Home in Lexington, Massachusetts. There will be a short service at the same location on Monday at 10:00 a.m., and the funeral will be at Sacred Heart Church in Lexington at 11:00 a.m.
From the earliest time I became aware of the AMS (mid 1950s) Ken Spengler was the Executive Director. He led and served the AMS over many years. After I met him the first time in the mid 1960s, he always remembered me and sought me out to say hello at every AMS annual meeting where our paths crossed. He believed passionately in the AMS and his enthusiasm was contagious. Even in recent years when he had long since retired from active AMS duties, he came to as many Council and Annual meetings as he could. The AMS was simply a big part of his heart and soul. We’ll all miss him. I first met Ken 52 years ago when I arrived in the MIT Meteorology Department to begin graduate studies. He was an instant mentor, and a wonderful “encourager” for many new entrants into meteorology. He quickly became a very important role model for me (and for so many others!) – and he represented the most important person in our field (other than our faculty supervisors) for generations of life-long meteorologists. Ken was a major influence throughout my career, and he led me to take an active role in the AMS that has now continued over five decades. Notice of Ken Spengler’s death brought to me the feeling that I had lost both a dear personal friend of many decades and a beloved public figure. His role in the AMS can never be matched, but his career will always stand as the exemplar to which those who follow him can aspire. Mary Washington and I wish to pay our deepest respect to Ken Spengler for his service to the AMS and to the profession of meteorology. He set high standards for making the AMS serve the needs of our society. We share the family’s grief for his loss, but we celebrate his accomplishments and service to our field. Quote from my “Eyewitness: Evolution of the Atmospheric Sciences” (2001) , p.6. Georgene and I found Ken to be an unusually kind and considerate person. These characteristics were evident in both the big and little things of our relationship. When Georgene and I first brought our young daughter with us to an annual meeting at Disneyland, he volunteered to prepare an extra plate for her at the awardees dinner. Georgene particularly appreciated his considerate gestures when she accompanied me to AMS meetings in Boston. While waiting in the parlor, Ken would periodically wander in from the meeting just to chat for a few moments, a gesture that demonstrated to her a feeling of inclusiveness. At an annual meeting in Orlando Ken was thrilled when she, as a Lutheran, took a long ride on public transportation to attend a Catholic Mass and told him that she enjoyed the service. Ken and Peg were admirable people, whom we loved very much. I will never forgot that Ken’s passion for meteorology was only exceeded by his efforts to make everyone feel special. I recall my younger days as an AMS member, and how Ken always had time to thank and encourage me in my professional work. He was truly a person that made all of us feel better, both about our work in the field and about ourselves. He will be missed, but not forgotten. Uncle Ken was a kind, encouraging, and generous man. He was admired and respected. We always enjoyed gathering around and conversing with Uncle Ken. We are saddened by the passing of his and my father’s great generation and feel a responsibilty to carry on their committment to God, family, and country. My wife and I had dinner last night at the Shanghai Village restaurant in Arlington. Our first meal there was 25 years ago and we went with Ken and Peg. Other than my own family, no single individual has meant more to me nor done so much for me both personally and professionally than Ken Spengler. Thank you Ken. I first met Ken Spengler as a wet behind the ears, young Ph.D. at a conference in 1969. At my next AMS meeting a year later, I was astonished that he not only remembered my name but asked me about how my specific research project was going. This was typical Ken Spengler. His devotion to the AMS – and his caring for its members as individuals – was legendary. He personified the meaning of the words gentleman, professionalism, courtesy and integrity. As AMS President and MC for the 2005 Annual Meeting banquet in Atlanta, I requested all stand and salute Ken for attending his 60th consecutive annual meeting – and we all knew that the thunderous and affectionate applause was to celebrate far more than that milestone alone. I was honored to lead the effort to show our appreciation for what Ken brought to the AMS by establishing the annual Kenneth C. Spengler Award, granted by the Society for those “whose efforts have contributed to the growth of the weather and climate enterprise while materially fostering a sense of community and creating synergistic linkages between the public, private, and government sectors as well as the user community.” This is a fitting way to perpetuate his memory and honor the spirit of Ken Spengler and all that he meant for the AMS and its members. Like so many many aspiring meteorologists (and related sciences of course) my first meeting and knowing Ken Spengler was something I will always treasure. His impact on not only the AMS, but all our sciences and their application to the country and world is immeasurable. When future generations of meteorologists look back on the history of our shared sciences, as they should, and the epochal changes in the last 50+ years as meteorology moved from an art form/science little understood by anyone else to a true science of tremendous acceptance, social and economic benefit, Ken Spengler’s name will be right up there with the Rossbys, Charneys, Soumis, Atlases and so many other giants of our profession. All of us who shared time with Ken were and are so lucky. My memories of Ken begin in the period 1948-50 when my Dad was president of the AMS. I recall conversations with Dad working to raise Ken’s executive director’s salary to $10,000. Henry Houghton opposed the raise, but Dad persisted and won this disagreement. The rest is history. Ken led to Society in so many different ways and influenced the lives of thousands of meteorologists, including my brother, Harry, and my own for the past 50 years. He will indeed be missed by all of us. I joined AMS in the 70s and met Ken at my first conference shortly thereafter. I was just beginning my Air Force career as a fledgling meteorologist, but Ken made me feel like the most important member of the Society. I soon noticed he was that way with everyone. A year later, he remembered my name — no prompting, no help — he had that gift. As my career broadened and my responsibilities increased both on the job and in the Society, I frequently sought out Ken for his advice and counsel. He always found time and became a patient mentor and a true friend. We will miss him. Ken’s intelligence, common sense, and devotion to the AMS and to meteorology set a standard that has not been duplicated. His passing is a matter of great sadness to me personally, and to the field as a whole. I have two memories of Ken Spengler that go back to my early years in the profession, when I was just starting to go to AMS conferences and meeting the people who would later become lifelong friends. The first one was in 1985, when I was stationed at the AF Geophysics Lab at Hanscom AFB, MA. I was going to an AMS conference in Boulder, and Ken Spengler and Evelyn Mazur were on the flight from Boston to Denver with me. We were delayed on the ground at Logan Airport due to snow in Denver, so we all arrived very late in CO. It was my first trip there, and not really knowing my way around, Ken was kind enough to offer me to join him and Evelyn in the cab ride to Boulder very late in the evening. My second memory was at a conference in Monterey in 1989. At this point, I was a Ph.D. student at Penn State and was presenting my initial research results. Shortly after checking into the hotel I was looking for the closest church to attend mass, and discovered that Ken and Evelyn were doing the same thing, so together we went to this very old, Spanish-style church to attend mass there. I always found him to be a gentleman, and like many of the others who’ve posted here have said, always knew your name and asked about you, even if it had been a while since he last saw you. The AMS is a lot like a close-knit family, and a much of that credit goes to Ken Spengler for his leadership, and always making you feel welcome, whether you were a newcomer like I was, or a member for 20 or 30 years. My condolences to his family but comfort in knowing that he lived a long, successful life and touched many people in the process. I joined the AMS as a student in the mid 70’s, but didn’t get to know Ken until few years later when WSI was founded. I will never forget his unwavering support for the emerging private sector. He offered the AMS as a “neutral ground” for discussions with the NWS about making data available through (what were then) high-speed links so that the private sector could generate value-added products and services for redistribution to end users; this resulted in the NWS’s “Family of Services.” Ken was always available for wise counsel and advice, whether it be on Society or personal matters. He tirelessly represented our industry — and our entire profession around the world for decades. For this an so much more, we are grateful to Ken. Generations of meteorologists have been, and will continue to be the beneficiary of Ken’s leadership. It was important to me to pay respects to Ken and his wonderful family earlier today as Ken so positively influenced my career in meteorology. As Jim Mahoney’s first graduate student, I met Ken when I presented my first paper at an AMS conference in 1970 . I was struck by the personal interest he showed as he took the time to introduce me to others he thought I should meet. Over the next few years he further encouraged my active participation to join committees, publish, help with the creation of the AMS/EPA Cooperative agreement and other efforts that brought air pollution meteorology into more of the main stream of the AMS. Those early impressions stayed with me and held true as he so symbolized the integrity , professionalism and good will of the AMS membership. He will be missed. Though an AMS member since 1981 I didn’t get to know Ken until I joined the AMS staff in 1998. Shortly thereafter my first son died at the age of 8 weeks. I will never forget the sincere compassion he expressed and the gentle encouragement he communicated to me as I tried to recover from that tragedy. He did this quietly and behind the scenes and I bet there are many other people who benefited from his kindness……far more than is widely known. It was a true pleasure knowing Dr. Spengler! In my view he was a very mild mannered gentleman with a smile always on his face. He met my mom on several occasions during AMS staff functions and welcomed her with open arms…literally (smile). He would hug us and always have a meaningful conversation for us. I pray that his family will find comfort and peace knowing how wonderful and meaningful Dr. Spengler’s life was here, not only to the scientific community but to many others as well. You will be missed Dr. Spengler!! I just learned the sad news of Ken’s passing. I was lucky enough to serve on the AMS Council back in the late ’80s and remember so well how welcoming he was to Diane and I, even though we were not American, or maybe especially because of it. But he was so gracious and welcoming to everyone that it would be impossible to forget him. For me he was the embodiment of the AMS and a fantastic role model of service to the meteorological community. He encouraged so many to get involved and follow his example, a truly inspiring leader. His spirit, enthusiasm and engagement will live on through the many many that he inspired and encouraged. It is hard to summarize in a few sentences all that I have been feeling over the past few days. I have so many fond memories of Ken over the years and I feel so lucky to have had the opportunity to get to know him well, especially in the past decade or so. I will always think of him with the little grin and the twinkle in his eye that he got as he told a story from the past. He made everyone he talked to feel special. Almost 30 years ago I walked into the building at 45 Beacon Street to be greeted by Dr. Kenneth Spengler. I had applied for a position at AMS for which Dr. Spengler and James Caskey, editor of BAMS at the time interviewed me a total of three times. I thought that the job was going to be a stop over while I searched during the next six months for a more challenging situation. Well these years later I am still at AMS. Dr. Spenger is one of the many reasons for my lengthy and successful career at AMS. He always showed me respect and trusted me and my recommendations for moving things forward. There are many stories from the years but I think one of the best had to do with the annual business meeting held at the AMS annual meeting each year. It was the first annual meeting of my employment. As IT manager at the time, and as the only person who was able to query the various databases, I was asked by Dr. Spengler to gather data about various members. In particular how many folks had passed away that year. I gave him the results of my query. At the meeting Dr. Spengler stood up and read off the list of deceased members. When he was done a voice from the audience spoke out ‘but Ken I’m not dead’. Most would have been very angry and irritated but Dr. Spengler addressed the issue with grace and good humor. He reminded me to double check the data entry that was being done. Dr. Spengler was one of the most charming people I have ever met. A diplomat by nature and a senator by default. He will be missed by the entire AMS community. I hope his entire family finds comfort in all the great memories and times that were shared. 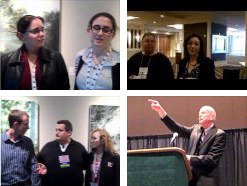 I had the great pleasure of working with Dr. Spengler at the American Meteorological Society. He was truly a warm, kind, and generous man. He would always stop me and ask me how I was doing. He also made it a point to ask about my family. He had such a great memory. I would be amazed that he would remember a small detail that I had mentioned to him months earlier. It was a true indication that he really listened to what I had to say. Dr. Spengler was a such a gentleman…charming and polite. He was very genuine…a one of a kind. I will miss him dearly. I have known Ken all of my professional life. I met him first while in grad school. Charlotte and I enjoyed Ken and Peg’s company at the AMS annual meetings as well as in Geneva. These were wonderful moments in our life. Ken had several attributes that made him a remarkable Executive Director. He had the innate ability to hear your name and find out somethings about you and then never forget any of the details. Many of the above messages attest to that ability. Ken planted seeds. He would talk to you about an idea that he had and ask you what you thought about it. If it were a good thought, you would find that he had gotten you or someone else to move forward to implement the idea. I personally had several encounters like that with him. Ken was a mentor to many of us. He kept the gentle pressure on and guided you in what were the best practices for you and the AMS. To the best of my knowledge, Ken attended all AMS meetings while he was the Executive Director. He was always there for the community. Ken Spengler was one of a kind. The AMS was priviledged to have him as its Executive Director for so many important years. We were fortunate enough to know him. He will be sorely missed. One of the biggest surprises after I started working at AMS in 2001 was Ken greeting my wife and I at the holiday party 9 months later. We had only spoken once or twice during those months, and I had only briefly mentioned my wife by name. He not only greeted her by name at the party, but with his signature warmth and charm. She was immediately smitten. I feel lucky to have known him, albeit briefly, and his impact on AMS and its staff was profound and lasting. When i joined the AMS in 1960 Mr.Spengler was allready a fixture thire. I never met the man but he still hold a nice place in my memery. To me the AMS and Mr. Spengler are synomymous. I to am sorry to see him leave us. I was sadden by the losts of Dr Spengler,I have been a member of the AMS off and on since 1975 I didn,t know him in person but he did great things for the AMS and he will be missed. In the mid 1960 I, then a young captain and detachment special project officer, was assigned to host Gen. Spengler for his stay at Ramstein AFB. I was intimidated by his rank but was soon put at ease by his freindly unassuming manner. His manner reflected well on the USAAF Reserve, the AMS, and meteorology. I was amazed that when I came to 45 Beacon St. for a job ineterview in 1990 he remembered the visit and me. In the almost 20 years I have worked at AMS, I’ve admired the results of his work for the AMS and science in general. I am honored to be able to participate in this celebration of a great life well lived. Ken Spengler did so many good things to make AMS what it is today. And yet what I will remember him for most fondly is how he made young people just starting out in the AMS feel welcome. Not only was he always friendly — but he would remember our names. I feel honored to have known him. My experience with Ken Spengler always revolved around his devotion to the AMS, and the important role he played in transitioning the AMS to the modern innovative society that it is today. But even more, it was his graciousness. In all dealings, even when there were differences, he never was less than a gentleman, gracious in all affairs. And he graciously aged, his devotion to family and the society surely sustained him just as he did all of us. He left the society in great hands, thanks to the leadership and foresight he followed. His legacy in the AMS lives on through those that follow so capably. He was the face of the AMS and remains the soul. When I was in high school just south of Boston back in 1966, I visited the AMS Building on a Saturday with a friend. It never occurred to us that no one might be in, but Ken Spengler was there. He gave us a tour of the building and also gave us encouragement and a few copies of Weatherwise. Thanks to Ken, we went away feeling that we had chosen a field where people were kind and supportive of young people. Both of us majored in meteorology in college. There are only a handful of individuals besides my parents who have had a major positive influence on my life over an extended period of time. Ken Spengler was one of them. The definition of “people person” should have his picture next to it. He was one of the finest people I ever met. I found he genuinely cared about and was very interested in what was happening in my life. Everyone I know who knew him felt exactly the same way. He was a special person in the truest sense of the word “special” and he made everybody around him feel special . He spread goodwill wherever he went. He was a mentor to me – always encouraging and helpful on all matters – professional and personal. I had the privilege of serving on a number of AMS committees and boards and working with Ken on administrative aspects, paricularly on the CCM Board and the Admissions Committee. The AMS and all members have benefited greatly from his leadership. He was the ultimate role model as to how a person should act professionally and as a friend. I am grateful to have known and worked with him. I will really miss him. Ken Spengler was one of the guiding lights as I started my career at AGU. He was the perfect mentor after Waldo Smith retired. Ken demonstrated so effortlessly what it meant to serve members. I especially recall my first IUGG meeting in Hamburg. Ken helped me navigate the many different events– both the formal ones and the informal. He re-enforced the importance of getting to know the world community. In later years, we had many good discussions about journal publishing and society operations. No matter how busy he was, Ken had a way of giving you his undivided attention and making you feel that it was not an imposition. He was selfless in sharing his experience. His integrity was obvious to all. I was indeed fortunate to have known Ken and to have him as one of my life teachers. The members of AGU are also fortunate because his lessons benefitted them as well. Others have spoken of that wonderful twinkle in the eye, the warm smile, and the genuine caring. These are memories that I will cherish forever. Ken Spengler was “the” face (which never seemed to age) of the AMS for many decades. A gentleman who will be missed but whose impact will stay with us for many years to come. I feel honored to have had a chance to interact with him over the years. As I read over the comments above, I find myself nodding in agreement and smiling over and over again. I can only echo the consistently beautiful comments about this gracious, wonderful man. I had the pleasure of knowing Ken since the 1950s when I was involved in graduate studies at MIT and beginning to work with Don Kent at WBZ. Even in those early days, when private broadcast meteorologists were looked upon with considerable scorn by their Weather Bureau colleagues (and even some in the academic community), Ken worked tirelessly to help us bridge those gaps. Even to his last years, Ken enjoyed getting together for impromptu lunches with his local broadcast meteorologist friends including Don Kent, Fred Ward, Bruce Schwoegler, Barry Burbank, Bill Hovey, Josh Judge, Mish Michaels and myself. We will all cherish fond memories such as these about our times with Ken Spengler. Thank you Ken! A particularly bright rose has been harvested from our garden! Ken Spengler was the guiding light that has imbued the AMS with its warm and friendly spirit. It remains there to this day, even though we are so many now. I will continue to see his friendly face before my eyes whenever I think of him. In the 1970s, when I became active preparing for a meeting in Seattle, I met Ken for the firs time. Like so many other people in this comment list, I treasured his consideration in always afterwards greeting me by name and making me feel welcome—we weren’t many women meteorologists then, so it meant an awful lot. It was a natural part of him to be kind and considerate, that is why it is impossible to fully duplicate, but we can try. Ken Spengler’s legacy will remain the foundation of our society for a long, long time. Let’s remember to keep that spirit going! I first met Dr. Spengler in 1984 when I interviewed with him to help AMS develop a more robust exhibit program. I worked as a consultant to him for the next five years working on a number of exhibit and meeting activities. This included bringing the IIPS program into the annual meeting. In 1989 when Dr. Hallgren was getting ready to open the DC office, Ken asked me if I wanted a real job helping run the DC office. I, of course, accepted. The rest they say is history. I had the pleasure of working with him over nearly two decades until I retired. Although I had communicated with Ken in 1959, I first met him at the annual meeting held at Boston in January 1960. The occasion was the first issuing of A.M.S TV Seals of Approval when I received one. I believe I saw him at least once a year until his retirement. At his insistence we worked together to reignite the annual Broadcast Meteorology Conference, out of which this field expanded dramatically. Ken was a strong supporter of the effort of professional broadcasters as he recognized it as the profession’s face to the public. During the 70s and 80s it was always a pleasure to serve with him on the Council and various committees. Under his direction the Annual Meeting’s display of meteorological equipment exhibits grew from a single Alden facsimile machine to the immense floor space currently occupied. On his several journeys to the Tampa area he enjoyed his visits to our offices and was always complimentary and encouraging to the weather staff. I remember Ken for his warm, and friendly personality to me and others whether amateur or professional and his intense interest in their pursuit of meteorology. Yes, Ken’s still there, for all of us. I first met Ken about 1975 when I attended my first AMS meeting. He made a point of seeking me out and talking about our shared last name which in my family has been spelled both with an “a” and an “e”. Ken made a point of making me feel welcome in AMS and I always valued and sought his advice as I navigated the AMS committees and boards. I loved his humor over our shared name. I once received all his pink phone slips for a two days at an AMS annual meeting and was overwhelmed thinking initially they were for me. I also received a nice fruit and wine basket intended for him at the same meeting. We had a good laugh when I gave him the pink slips but said I would keep the fruit and wine. In the late 1980’s, he brought a book of the Spengler name history to a meeting and we decided that we were probably related back in Switzerland since our ancestors came from the same town. Ken was an amazingly steady and effector Executive Director for the AMS and I am proud to think that we share common ancestors.